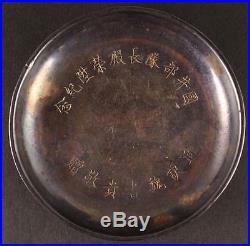 This is an extremely rare, antique Japanese military commemorative dish. The words on the dish are "Kunii unit leader promotion commemoration" and the bottom line "Respectfully gifted by translator Wei Guishu". As the name of the gifter obviously shows, the dish was given by a Chinese translator who was a collaborator with the Japanese and for this Mr. Kunii, who was leader of his unit. I could find some guy called Kunii who became a lieutenant colonel, but there's no way to tell if this is the same man. Either way, an extremely rare translator item (Rich's website only lists one such cup) which also happens to be a Chinese collaborator item. I'm sure I've never seen one of these, and I don't expect to see another anytime soon. Chinese collaborator items are virtually nonexistent. Anyone on the Chinese side who had one would've destroyed it unless they had a death wish. There's a maker's mark that's difficult to make out stamped on the inner edge of the bottom ring, with the Chinese silver mark on it, which denotes silver slightly more pure than Sterling. The dish weighs about 46g. There's one spot at 10 o'clock where it seems the metal has a nick, and tarnish. Final word: All the items I sell are guaranteed to be authentic. I list items on Tuesdays and Thursdays. Please check out my other auctions! The item "SUPER RARE Japanese MILITARY WW2 CHINESE COLLABORATOR TRANSLATOR SILVER Dish" is in sale since Monday, May 1, 2017. This item is in the category "Collectibles\Militaria\WW II (1939-45)\Original Period Items\Japan\Cups". The seller is "marshaln" and is located in Hong Kong.